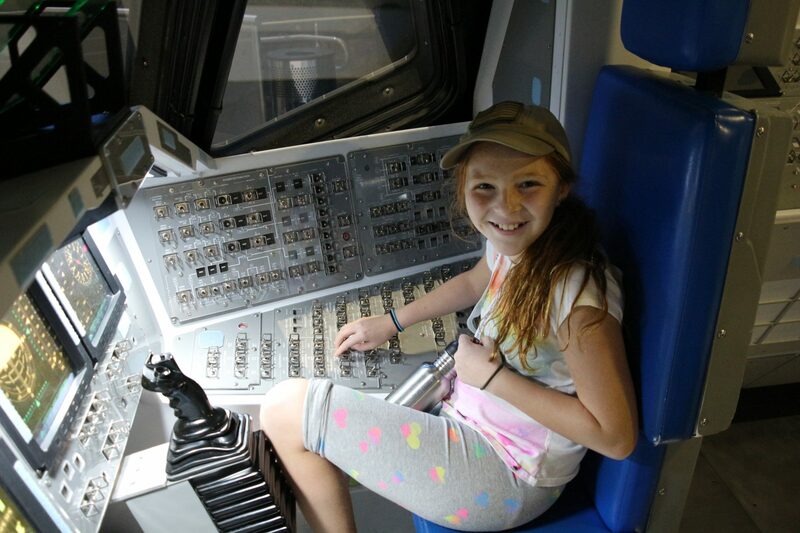 Last fall, I took my older daughter to visit Kennedy Space Center. She’s always been interested in science and technology, and she’d just recently finished a school project about Sally Ride which sparked some interest in aerospace science. I was going to be out of town for her birthday, so this was an early birthday present for her. It also seemed like a great opportunity to nurture this new interest. 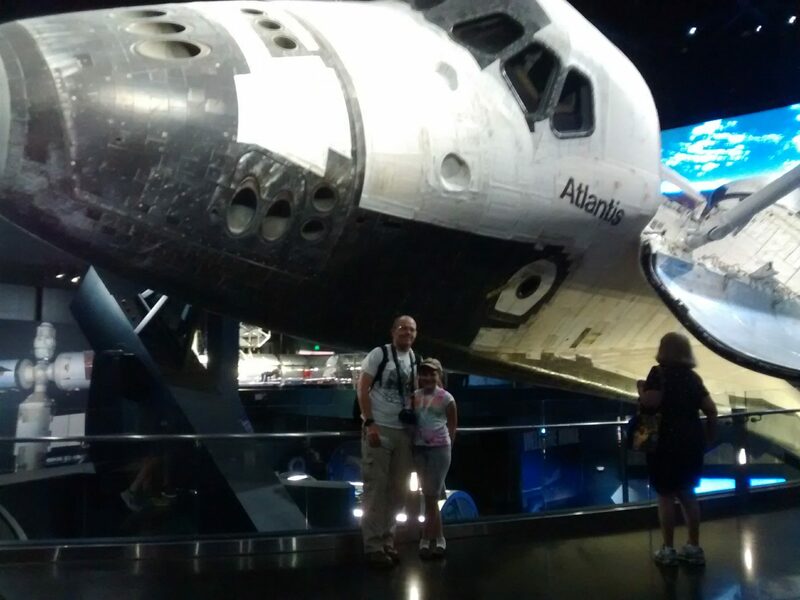 Sharon & I visited Kennedy Space Center about 15 years ago before we were married. Neither of us had been there since, so my trip there (especially with a kid in tow) was a bit of trial & error. Here’s some of what I learned. Where In The World Is Kennedy Space Center? 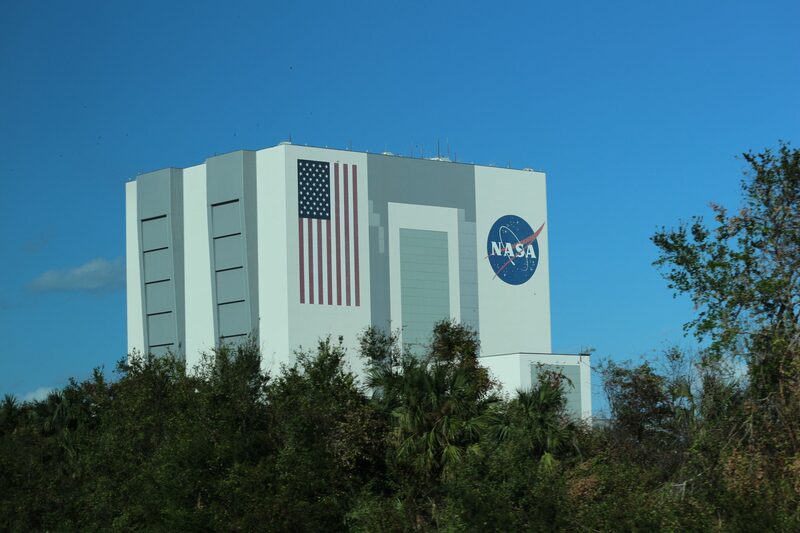 Where: Kennedy Space Center is on Florida’s East Coast, in an area aptly called the “Space Coast.” It’s driving distance from both Daytona and Orlando (and from Jacksonville – we made it a day trip). There is more to the Space Coast than just Kennedy Space Center – beaches, boating, lots of outdoor stuff. But most of it is at least 20 minutes away and not particularly convenient in relation to KSC, plus there’s no public transportation to and from the space center. Even the nearest hotels are about a 20+ minute drive. This isn’t a big deal – just something to keep in mind when planning your itinerary, especially if your whole family isn’t spending the day at KSC. For your non-NASA-inclined family members (like my younger daughter), the Brevard Zoo is about a 40 minute drive, as is Merritt Island National Wildlife Refuge. The Space Coast has beautiful beaches, and you can find a number of options for boating & kayaking. 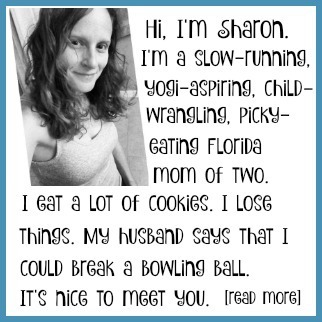 Sharon has her eye on Canaveral National Seashore (about a 20 minute drive) but she’s saving that for a future trip. Okay, But What In The World Is Kennedy Space Center? 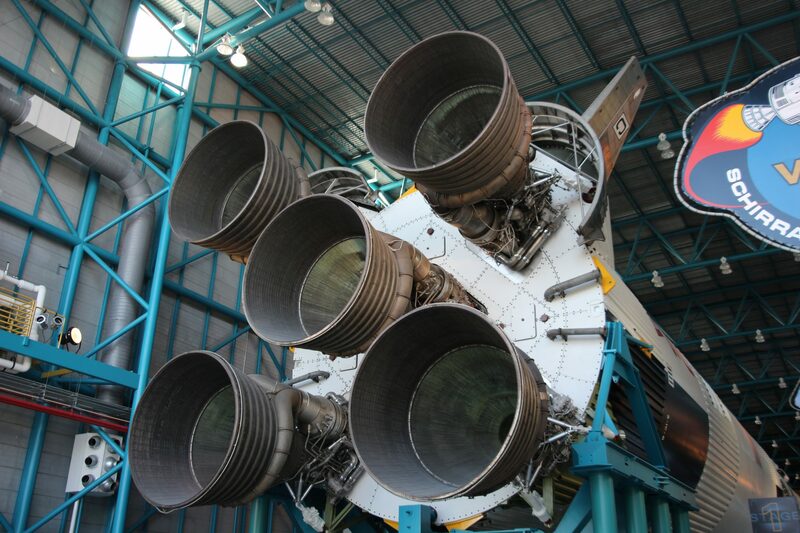 What: Kennedy Space Center is NASA’s launch headquarters for human spaceflight and a space lover’s dream! You can get up close to rockets from NASA’s Mercury, Gemini, and Apollo programs; experience space in 3-D in the IMAX theater, and even meet a real astronaut. 2. Shuttle Atlantis: This is the actual Space Shuttle Atlantis! This multi-level exhibit tells the story of NASA’s 30-year Space Shuttle Program and includes a mock-up of the shuttle’s cockpit and lower deck. Sophia had just learned about Sally Ride and her trips in the space shuttle, and I could tell that seeing an actual space shuttle made a real impression on her. There’s also a kids area with a slide and activities nearby. 3. Apollo Visitors Center: This is my personal favorite. The sheer size and complexity of the Apollo program is fascinating to read about; however, you can’t even begin to comprehend the scale of the rockets used until you see one in person. An actual Saturn V rocket assembly identical to the ones used to send humans to the moon and back is on display. It absolutely dwarfs the Space Shuttle launch system in terms of size (although it is equally an amazing achievement). 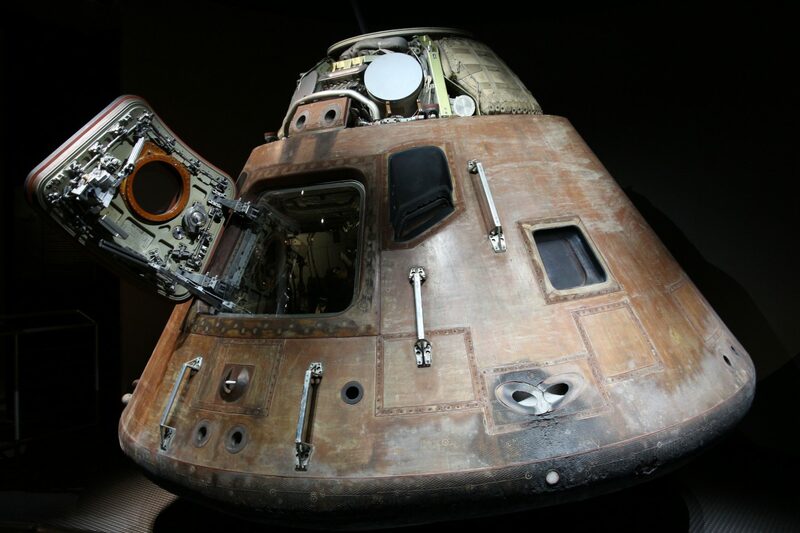 You’ll also find actual moon rocks, space suits, a lunar lander mock-up, and more. Entry into the Apollo exhibit begins with a multimedia experience from the “launch control room.” It really sets a dramatic tone around the entire human endeavor to reach the moon. 4. Forever Remembered (Space Memorial): Not everyone who perishes in the pursuit of space exploration is an astronaut. I found it intriguing to see so many names that I had not read about. The obvious ones are there from the Apollo, Challenger, and Columbia disasters; however, there were a lot of names from brave individuals pursuing their dreams of becoming an astronaut. We were looking forward to seeing the Astronauts Hall of Fame, but unfortunately this area was closed. I don’t remember it being there during my original visit with Sharon. Sophia was very disappointed, but it left us all the more reason to come back another time. When: Kennedy Space Center opens at 9:00 a.m. 365 days a year. Closing time varies but is usually 6:00 or 7:00 p.m. You can check the hours of operation HERE. A bus tour is included with daily admission and operates until 2.5 hours before close. Keep in mind that Kennedy Space Center is a working spaceflight facility, so visitor complex attractions may be altered or closed. You can watch for upcoming launches on Kennedy Space Center’s official calendar. They also make launch announcements on Facebook and Twitter. How (Much): Daily admission is $40 for kids (3-11) and $50 for adults. We decided to upgrade to annual passes, which are $60 for kids and $75 for adults. Make sure you check the KSC website for special offers before your visit. Right now Florida residents can purchase a four-pack of daily admissions for $139 (this expires 3/31/17). Daily parking is $5 for motorcycles, $10 for cars, and $15 for over-sized vehicles, motor homes, or RVs. The official site recommends allowing 8 hours to enjoy all of the Kennedy Space Center attractions (another reason that annual passes are a good idea – you can break those 8 hours up into multiple days). There are loads of extras, special experiences, and packages that you can purchase in addition to your regular tickets. 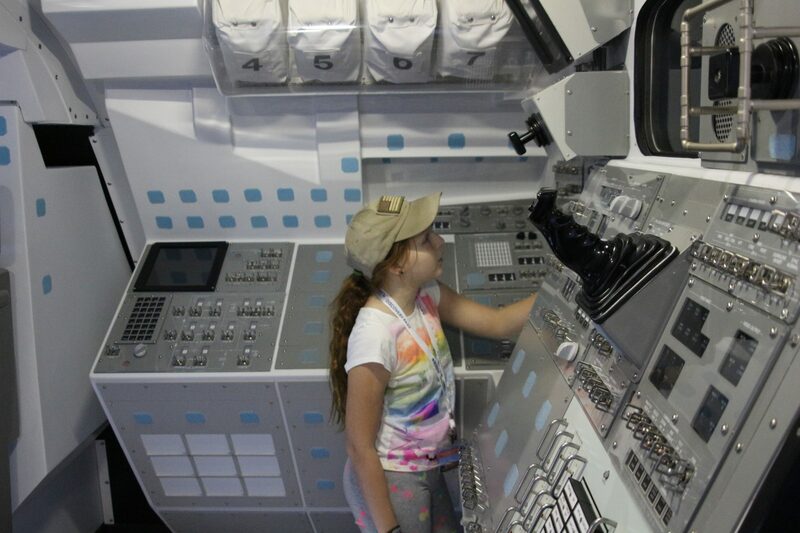 These range anywhere from $19.95 for the interactive Cosmic Quest experience to $199 (adults)/$174 (kids) to have a real astronaut lead you on a guided tour through the space center (this price includes daily admission; it is discounted for annual pass holders). I’d really like to have lunch with an astronaut during one of our visits. This is $29.99/$15.99 and includes a chef-prepared buffet lunch. 1. It’s a bargain. Initially I was reluctant to spend the money for tickets. Last time I was here, daily admission was $25. It’s double that now. This seemed like a lot of money relative to the last time that I was here, but it turned out to be so worth it. KSC has made significant additions since my last visit, such as the Astronauts Hall of Fame and the Space Shuttle Atlantis. Even better: You will leave here with your imagination inspired and your camera full of spectacular photos. What makes this trip most appealing to me is that everything here is REAL and not based on fiction like most of the other Orlando theme parks. There’s nothing wrong with fiction; however, being inches away from actual artifacts from some of humanity’s greatest feats of courage and daring is truly inspiring. 2. STEM: You’ve probably heard of Science, Technology, Education, and Mathematics (STEM). 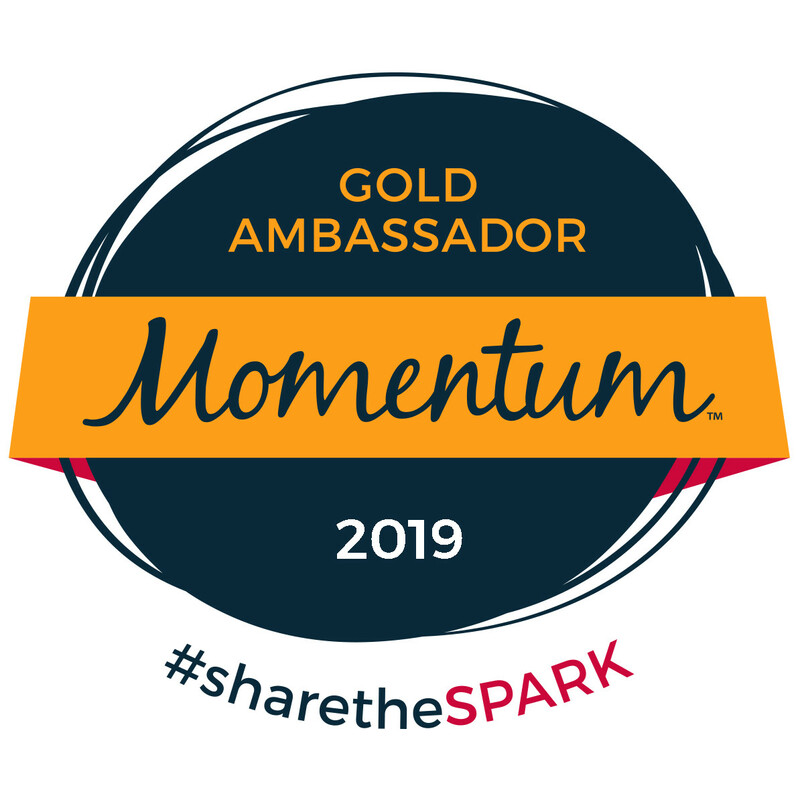 This movement is especially focused on getting young women into these fields. As an engineer, I’m excited about the prospect of Sophia choosing this for a career path and truly believe that she can be the first human (not woman) on Mars. It is often overlooked that STEM is a team effort. Although it is true that individuals make significant accomplishments alone (this is what’s romanticized), visiting Kennedy Space Center helps one to understand and appreciate the teamwork involved in great achievements. I wanted to nurture Sophia’s natural instinct to explore and encourage her goal to become an astronaut; but I also wanted to remind her that the people who help put those explorers in space (Rocket Scientists, Programmers, etc.) play an important role and that these professions are equally worthy of our admiration. 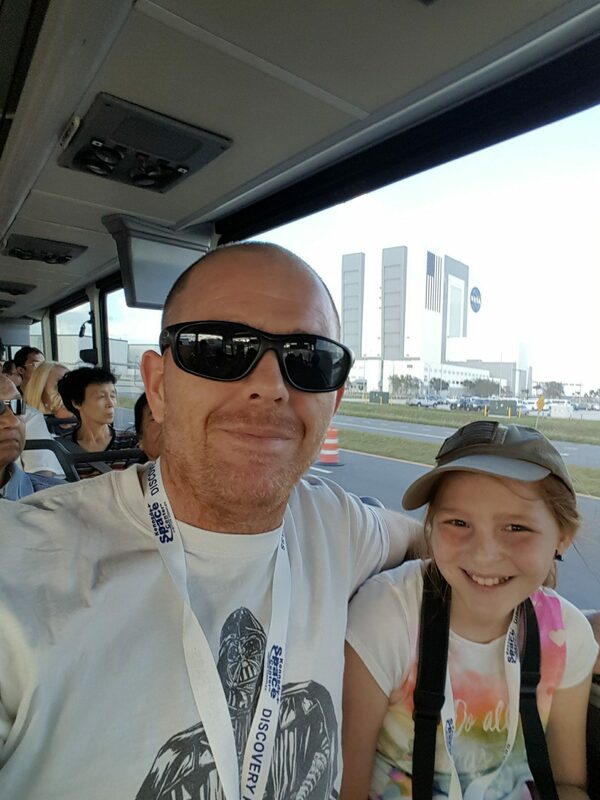 I have a few extra tips for making the most of your visit to Kennedy Space Center. 1. You CAN bring your own food into KSC. Small, soft-sided coolers are allowed. The only restrictions on bringing food and drinks into the complex are glass bottles (or containers) and alcoholic beverages. You can purchase beer inside the complex. There are 4 restaurants and 3 snack stands at KSC, but since theme park food rarely works for my picky eating family (and wallet), we always pack a lunch and bring it with us. 2. Your admission is good for an entire day, so you can leave and re-enter the park (don’t forget to get your hand stamped). Of course, there’s probably not much need for this, since there aren’t any nearby restaurants, hotels, or attractions. 3. The only reason I can think of to exit and re-enter the park is if you decide to pack a lunch and leave it in your car. There are picnic tables right outside the KSC entrance. The parking lot is much smaller than other theme parks, so you can pretty easily walk to your car, grab your cooler, and bring it over to the picnic tables. My lunch recommendation? Publix! Stop there first thing in the morning on your way to KSC and buy some subs & snacks. You haven’t really “done” Florida until you’ve had a Publix sub. 4. Go to the Apollo Visitor Center first. 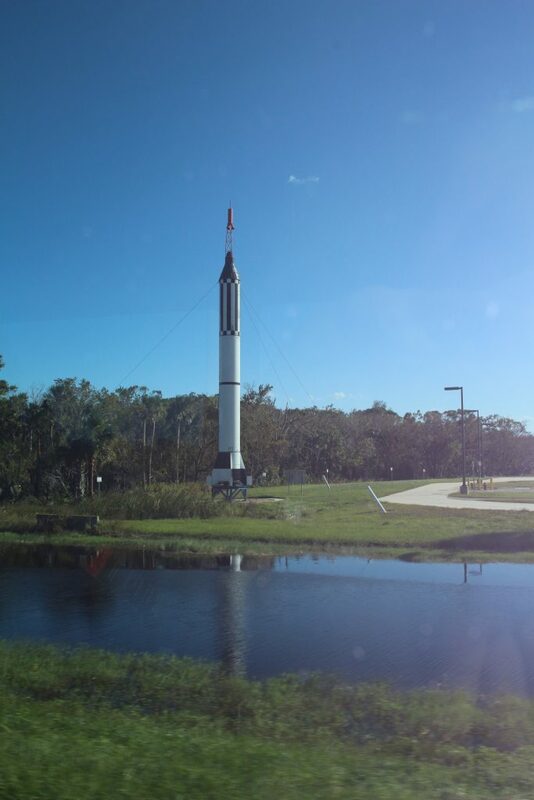 This part of the park is only accessible via the Kennedy Space Center tour bus. The bus ride takes about 20 minutes (each direction), and the buses stop running 2.5 hours before the park closes. 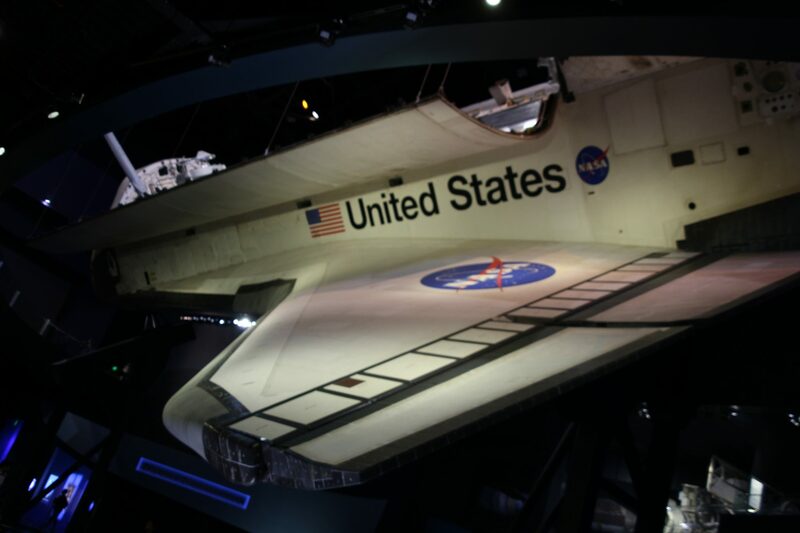 As I mentioned, this was my favorite part of Kennedy Space Center, and I could have easily spent hours here. 5. Kennedy Space Center is not one of those “something for everyone” kind of places. While there is a wide variety of exhibits and activities, not every kid (or adult) is going to love it. But I think you’ll find that this will correspond more with your child’s interests than with his/her age. A 3-year-old who is into space and rockets might have a blast, while a 12-year-old who couldn’t care less about space might find it all completely boring. Launch viewing is always available from the main visitor complex and is included with daily admission if the launch takes place during operating hours. The other 3 viewing sites are not available for every launch and require an extra fee (these prices vary). Launch tickets can be purchased no earlier than 2 weeks in advance. KSC offers lots of helpful tips & instructions for watching a rocket launch, and I suggest you read them thoroughly when planning your trip. 7. Talk to the employees! While we were shopping for souvenirs, I was making small talk with the cashier about how Buzz Aldrin was always featured in interviews and was a very vocal advocate while Neil Armstrong was never heard from again. This didn’t make sense to me since Neil Armstrong was first on the moon. The lady informed me that Neil Armstrong was a very private individual and family focused individual. Memorabilia with his autograph is especially valuable because he was first on the moon AND he didn’t sign a lot of materials as he avoided the public spotlight. We’re planning to visit again soon – we hope to see the Heroes and Legends exhibit, have lunch with an astronaut, and hopefully see a rocket launch before our tickets expire. We’ll be sure to share any new tips we learn during our future visits. Is there anything else you’d like to know about visiting Kennedy Space Center, or anything you can share to help out a fellow reader? Leave your questions and tips in the comments! Thank you so much for all the helpful information . We are planning a trip on Fathers Day,2018. This helps us know what to see first, and where to look. Hi Bonnie! I’m so glad! 🙂 We’ve got a field trip there later this month, so if I think of anything new I’ll add it. Hope you have a great time! I found this via your Instagram feed and what a great review. It’s a long time since I’ve been to Florida. One of the few things that the USA can be proud of in this current time of poor statesmanship. Why not post your pics on Instagram as I follow this rather than a bloated email inbox or Facebook feed. Hi Stuart! Glad you found us. 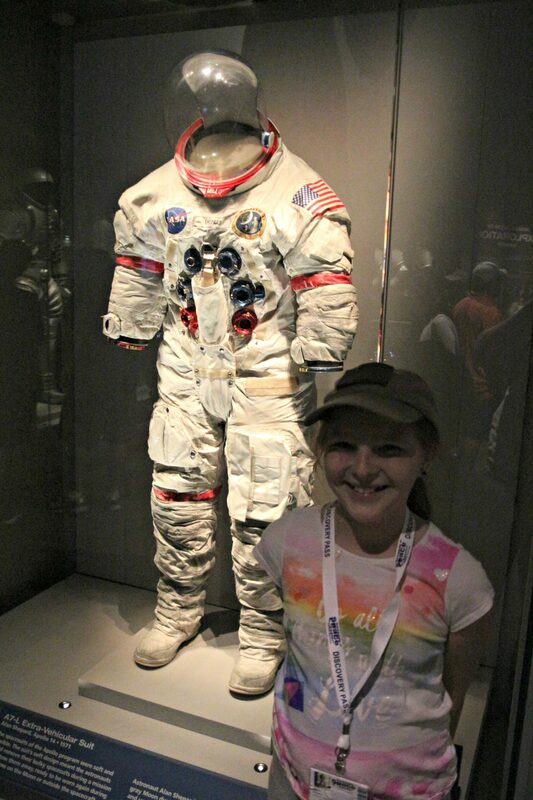 I remember visiting Kennedy Space Center on school field trips as a kid, and I loved it back then too. @TravelforMortals is a brand new Instagram account. 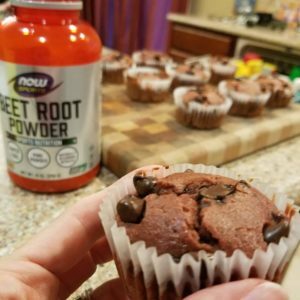 Our main account is @mommyrunsit, and I post there regularly with a little bit of everything, including travel pics. Thanks for reading! Pretty impressive from a guy who buys his clothes in bulk, right? :). When I went to KSC a few years ago, there was an astronaut (they’re still called that if they never went to space, right?) Walking around with a tile from an actual space shuttle in a briefcase. He was happy to open up the case & let us touch the tile & ask questions. I was pleasantly surprised about how entertained I was while I was there. Has Sophia seen the movie, “Hidden Figures?” I think she’d like it. Very cool! They got to hear an astronaut speak briefly last time, but nothing hands-on like that. She hasn’t seen it, but I think she’d like it too. I want to see it also. Will definitely watch once it’s on DVD. Love you!